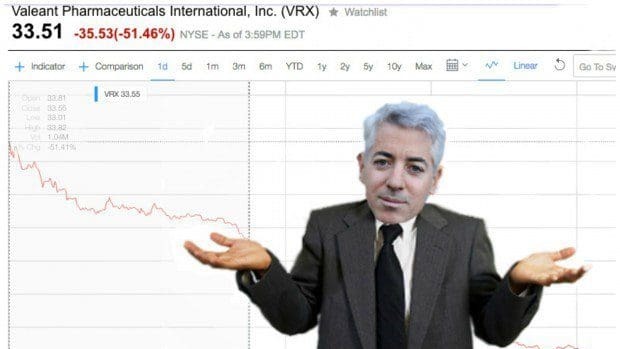 There was a time when a lot of blame for Pershing Square&apos;s losses could be placed on the shoulder&apos;s of nemesis and short Herbalife, the purveyor of supplements and shakes that just won&apos;t die, despite Bill Ackman predicting its imminent death for over three years now. Now, that honor goes to a company that starts with a &apos;V&apos; and ends with a &apos;f*cking-aleant." The billionaire has been fighting to turn things around for his hedge fund, which has lost billions of dollars in recent months. Pershing Square Holdings, the publicly listed entity of his firm, reported on Wednesday a year-to-date loss of 25.2 percent as of March 22. The majority of the losses stem from his very public all-in bet on Valeant Pharmaceuticals International, whose shares have been battered even with an uptick this week. So far this year, shares of Valeant are down 67 percent. Well, maybe not "weird," but certainly painful and right to the jugular. Or at least just reevaluate his relationships with Herbalife and Valeant.